This all-inclusive sales series is designed for security industry professionals, yet offers proactive prospecting tools applicable in any industry. 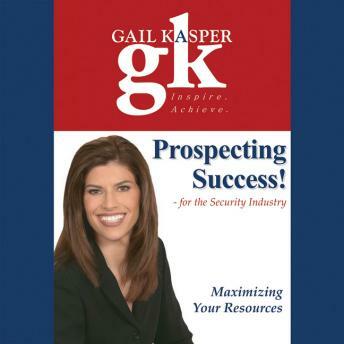 Guaranteed to increase revenues for your business immediately, Gail Kasper brings her most powerful sales techniques that have been proven in leading organizations across the country. This is 'prospecting in a box,' everything you'll need to know to generate and diversify your lead generation approach: vertical market development; upselling existing customers; trade show lead generation; referral maximization; cold calling by telephone and in person; alliance developing and management; effective networking techniques, including Gail's proprietary networking system - the newspaper technique; and guest speaking in the industry, where Gail provides speech examples that will both educate and inform an audience, encouraging more sales. This high-level sales program delivers step-by-step process, examples, and a complete PDF workbook to help you create your own plan.